The Golf R comes standard with 18-inch alloy wheels shod with summer performance tires. I basically feel the same way about the top performance model in Volkswagen’s North American compact-car lineup—the Golf R. Here is a 4-door hatchback that starts at more than $36,000 and can be optioned up beyond the $40K mark quite easily. Forty thousand dollars for a compact 4-door hatchback? Ouch. But this is no ordinary 4-door hatchback. 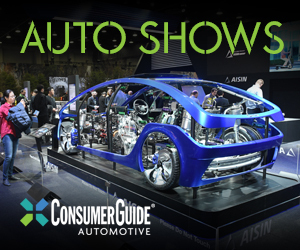 The Golf R is powered by a 292-horsepower turbocharged 2.0-liter 4-cylinder—an 82-hp jump over the base Volkswagen GTI—and comes standard with all-wheel drive, a very rare feature among non-luxury-brand compact cars and sporty/performance cars. Also standard are upscale features such as supple leather upholstery, heated front sport seats, adaptive xenon headlights, ambient interior lighting, dual-zone climate control, keyless entry and starting, touchscreen infotainment system, and an 8-speaker stereo. The Golf’s basic hatchback design means there’s a decent amount of passenger space inside the R, though rear-seat legroom can be tight behind tall front-seat occupants. Fit and finish are top notch for the class. 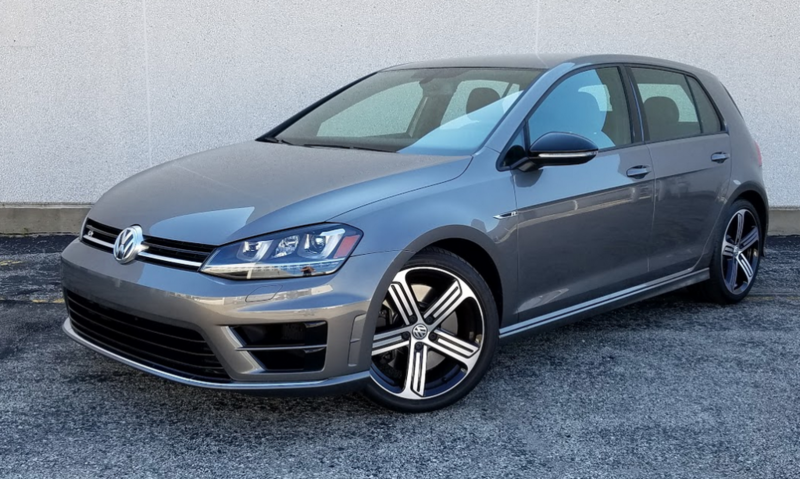 Essentially, the Golf R takes the strong points of the beloved GTI—the robust acceleration, the agile handling, the upscale interior feel—and amplifies them. The R’s turbo 2.0 is smooth and docile in everyday driving, but it really comes alive when you want to play. Turbo lag is almost nonexistent, and the engine pulls smoothly and strongly all the way to redline, emitting a satisfying snarl the whole time. The 6-speed DSG automated-manual transmission isn’t as clunky in around-town driving as some we’ve tested, and its shifts are lightning-fast—yet smooth—when you’re driving aggressively. The responsive steering-wheel shift paddles provide an extra degree of control as well. Potent as the Golf R is, it is also practical. Even with the rear seatbacks in place, there’s plenty of useful cargo space. 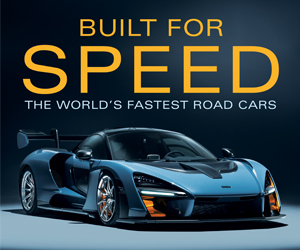 The all-wheel-drive system delivers tenacious grip that’s beneficial in both inclement-weather conditions and high-performance driving. The suspension is quite stiff compared to other Golfs, but is still perfectly livable considering the Golf R’s handling capabilities—and it’s still a notch above the R’s competitors in terms of comfort and bump absorption. 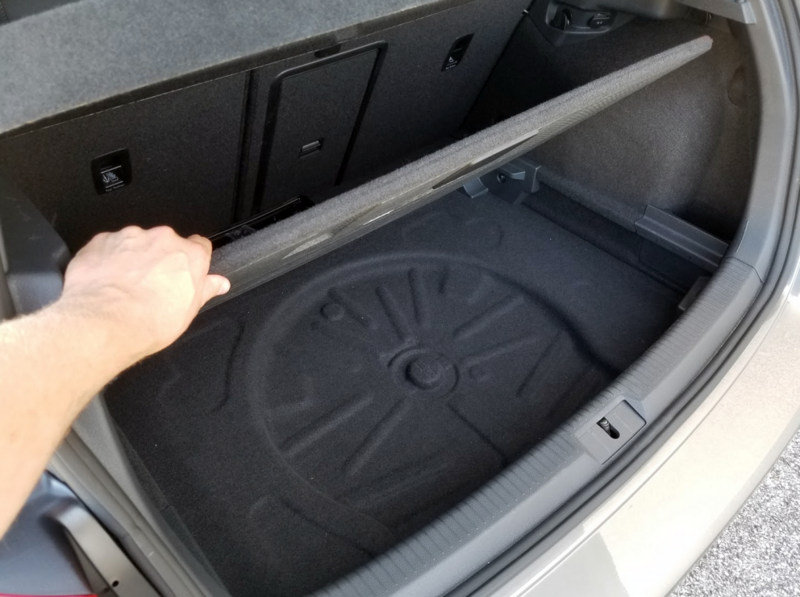 Instead of a spare tire, the Golf R comes with an electric inflator, a can of tire sealant, and a bit of additional storage space under the load floor. All VW Golfs have interiors that are among the nicest in the mainstream compact-car category, but the Golf R’s cabin is almost at an Audi level of luxury. The front sport seats offer a fine blend of comfort and support, and the high-end leather upholstery has classy contrast stitching. The switchgear moves with silky precision, and chic details abound. There is plenty of satin-finish- and piano-black trim to liven things up, and we’re especially fond of the “carbon-fiber-weave” detailing on the shift lever. 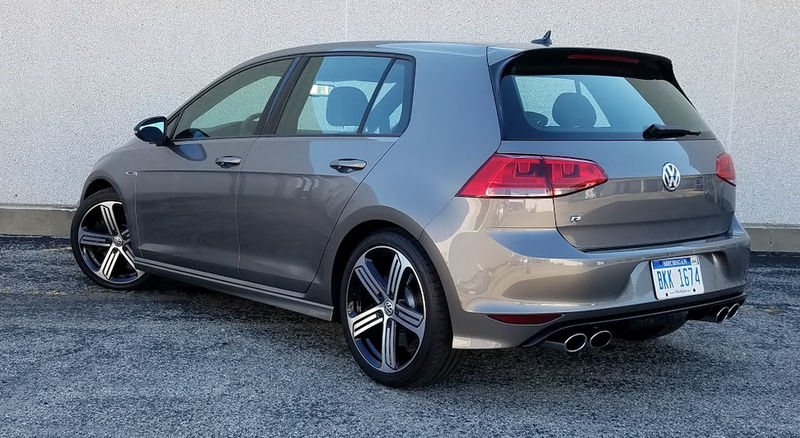 The Golf R’s exterior has a similarly sophisticated feel, with subtle “R” badging, handsome 18-inch alloy wheels, and slightly more aggressive front and rear fasciae. There’s no boy-racer silliness here. The Golf R’s most direct competitor is Ford’s ferocious Focus RS, another hot-rodded AWD 4-door compact hatchback with a hefty price tag. Subaru’s WRX STI sedan is another logical rival. 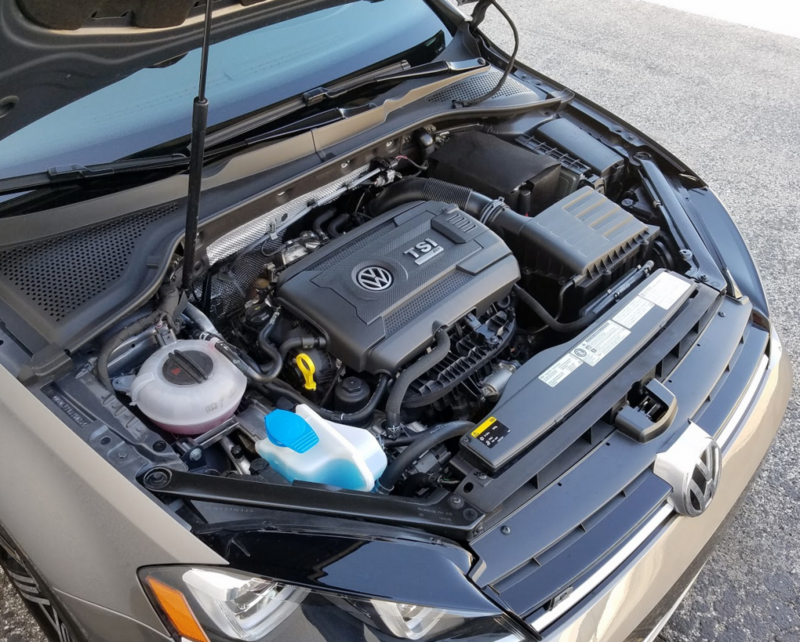 Both of those vehicles outgun the Golf R in the horsepower department (the STI puts out 305 horsepower, the RS a snarling 350) but neither is as polished or refined overall as a Golf R.
The Golf R’s 2.0-liter turbocharged engine produces 292 horsepower–82 horses more than the same-displacement engine found in the base GTI. It’s hard to fault the Golf R for much, other than its price tag—and even that is a matter of perspective. When compared to the GTI, the Golf R’s tariff seems pretty steep. But the R also compares quite well to Audi’s S3 sedan, which costs a lot more and doesn’t offer the versatility of a hatchback. Sometimes $8 candy bars are worth it. The Golf R is expensive for a compact hatchback, but to the right enthusiast, it’s worth the price. Written by: The Daily Drive staff on November 30, 2016.on December 2, 2016.